I deployed a Laravel app on Heroku, using Cloudflare for SSL. As a quick note, here’s how I did it. Deploy the app on Heroku and make sure everything works fine using the heroku app url. Add the domain names to your app in Heroku (in the settings tab for the app). Make sure you add both the root domain and www if you’re using it (example.com, www.example.com). Don’t activate SSL in Heroku. Add the site to your Cloudflare account (choose the free plan, when asked). Point your domain to Cloudflare by changing the name servers (at the registrars control panel) to the ones Cloudflare gives you when adding the site. Wait for the name server changes to go through. It will be notified under the Overview tab on Cloudflare. When this is done you will administer the domain records on Cloudflare instead of your domain regristrar. Remove all the DNS records you don’t need, under the DNS tab in Cloudflare. For the next step to work you need to remove the A records for the root domain – since you won’t point it to an IP address, but a domain on Heroku. Point Cloudflare to your Heroku app by adding cname records pointing to the Heroku app url. Also, you need to set your Laravel environment variable APP_ENV to production (or at least something else than local). Do this in the Heroku app settings tab. 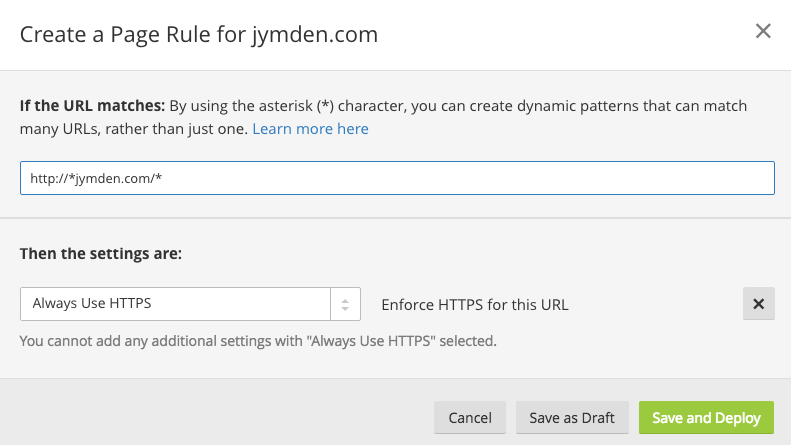 Now try to enter your site with https. It might take a while for it to kick in.